Planet Wise Wet Bags - Perfect Storage for Cloth Diapers! When it comes to dirty diaper storage we all want something that will keep the mess and odor contained. Planet Wise Wet Bags are perfect for your home or travel. 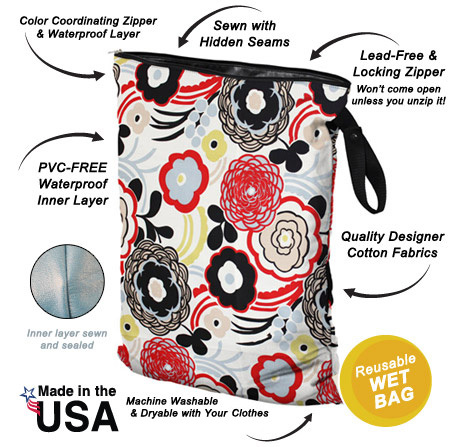 Each wet bag is sewn with hidden seams, innovatively sealed, so that no liquid can escape. This patent-pending technology also helps contain stink so nobody has to know what is inside your Planet Wise bag. Great alternative to a diaper pail. Store dirty laundry--perfect for travel and small living spaces! 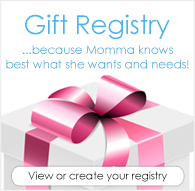 Hold wet bathing suits and towels from the pool or beach. PVC-Free Means Safer for You and the Earth! PVC, or polyvinyl chloride, is the most environmentally damaging of all plastics and is detrimental to human health. Planet Wise Wet Bags are PVC-free to protect the health of our families and our planet. These bags also utilize lead-free locking zippers for added safety. Wash and reuse your Planet Wise Wet Bags and save plastic bags from the landfill! 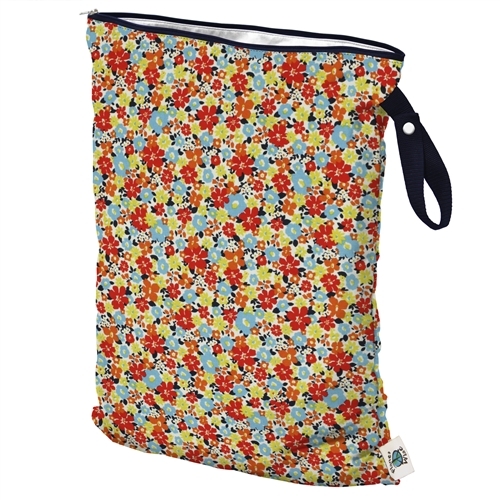 These easy-to-care-for reusable diaper totes are largely stain and odor resistent. Toss them in your regular wash and dry cycle along with your cloth diapers and diaper covers. As with all cloth diapering products, we do not recommend bleach, borax, or similar additives in order to preserve the quality of your wet bag. 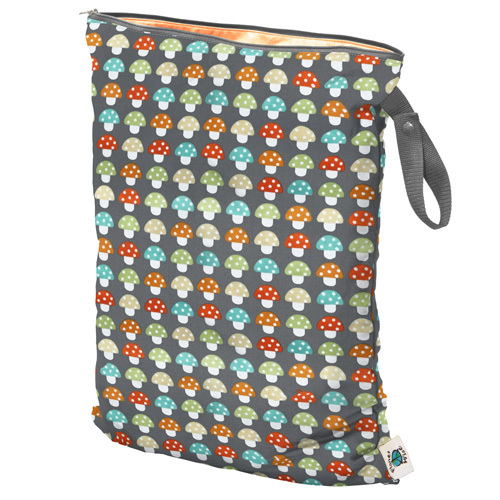 Planet Wise makes my favorite wet bags because they are so good at containing wetness and smell, and they have some of my favorite prints. Celestial Sea is in my top 5 favorite prints of any brand! When I first bought the large bag I didn't fully realize how big it would be! Definitely large enough to hold all the diapers you'd need for a weekend trip. I also use one of these bags to hold all of the unpaper towels and kitchen towels we use for the week and then I just toss it in the wash with everything else. This was exactly what I was looking for my daughter. She is expecting her first baby in November 2018. This is a fantastic wet bag! It is very high quality and held up extremely well after almost 1.5 years of use! It is also very generously sized and holds 2-3 days worth of diapers. The zipper and snap handle are still in great quality, whereas some of my other wet bags are showing much more wear. I also like how the outside is the fabric and in the inside is waterproof material. Everything about this wet bag is great, highly recommend it! These bags are huge and feel so sturdy! I got celestial sea and its such a pretty print.